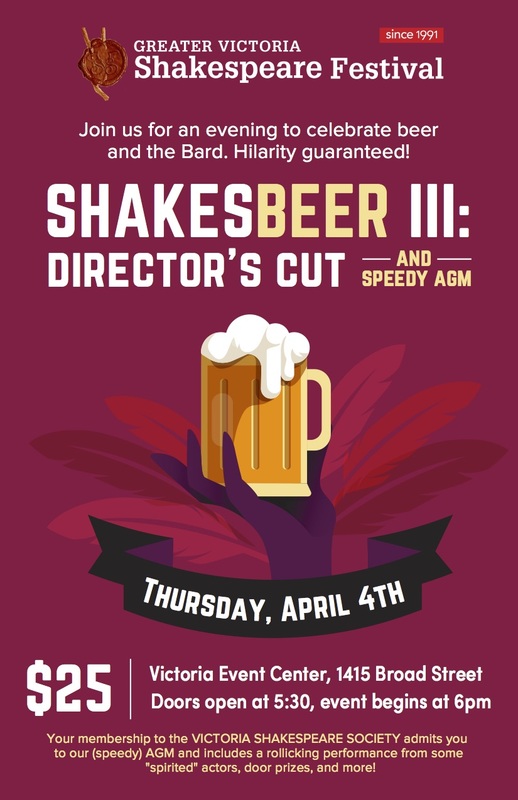 "We'll teach you to drink deep ere you depart"
Now it’s a trilogy: ShakesBEER III: Directors’ Cut! Actors are one thing, but what about hearing past GVSF directors describe the plays (while operating under a handicap)? The AGM will be a chance to hear about the successes of last season, and the plans for the next (it will be super-speedy, we promise)! Mark your calendars for Thursday, April 4. Doors open at 5:30pm, AGM begins at 6:00pm, Showcase shortly after. Beverages and snacks will be available for purchase. (Must be 19+ to enter.) Click below to purchase your membership online; also available at the door.